Join us on this 2.5 hour stroll through the French Quarter. 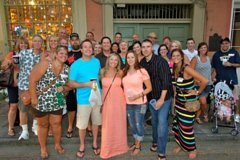 On this tour we will cover the history, culture, cocktails and much more of New Orleans. We will sample authentic Cajun/Creole appetizers and true New Orleans cocktails. Plus we will visit St. Louis Cemetery No.1 where New Orleans Voodoo Queen Marie Laveau is buried among other interesting characters. Off to where the city began, Jackson Square where you’ll get an in-depth account of the beginning of the French settlement to the Spanish takeover to the Battle of New Orleans. Your guide will tell you about the exciting history of the infamous pirate Jean Lafitte and his gang of cutthroat pirates. All through the French Quarter you will learn about the history of the Creole and other ethnic foods of New Orleans. Through this tour your guide will show you all the different architectures of the French Quarter and the three different countries that layered into this old city. Next your guide will take you to world famous Bourbon Street. Here you will hear firsthand stories of how your guide entertained and operated nightclubs and restaurants for 25 years. We will take you to the old days of the Bourbon Street scene that has long been forgotten. We will make a stop at two very well established French Quarter restaurants where you will be treated to authentic crafted drinks by real New Orleans mixologist and you will taste samples of our wonderful New Orleans cuisine. Lastly you will visit the oldest cemetery in New Orleans, St. Louis Cemetery No. 1. Learn about the City of the Dead where your guide covers the African culture, Voodoo religion, Music and the famous and infamous people that are laid to rest there. Cemetery is open until 3:00pm Monday through Saturday and until 12:00pm on Sunday.